I am a Candy Crush addict. I have been playing the game for a couple of years now. I find myself playing a least a few games every single day. I am on level 820. I have a few friends that are a few hundred games further than me. Sometimes it takes me awhile to beat a level because I refuse to pay for gold bars or extra boosters. One of my favorite boosters is the candy bombs. If you have a Candy Crush themed party, you will want to make some sort of candy bomb treats.. 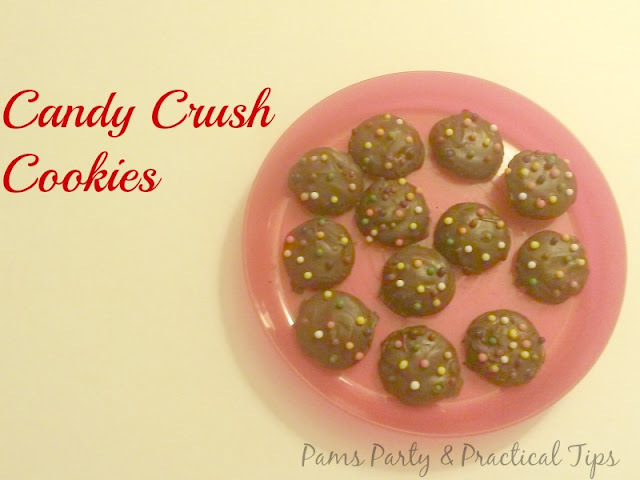 I have seen some cake pop candy bombs, but if you prefer an even easy way, these Candy Crush Cookies might be right up your alley. Disclosure, this post contains an affiliate link. You could use any round type cookie, but I chose vanilla wafers. I think I got these at the either the dollar store or Aldis. I know I used them as tired in my recent Candy Race Cars post. 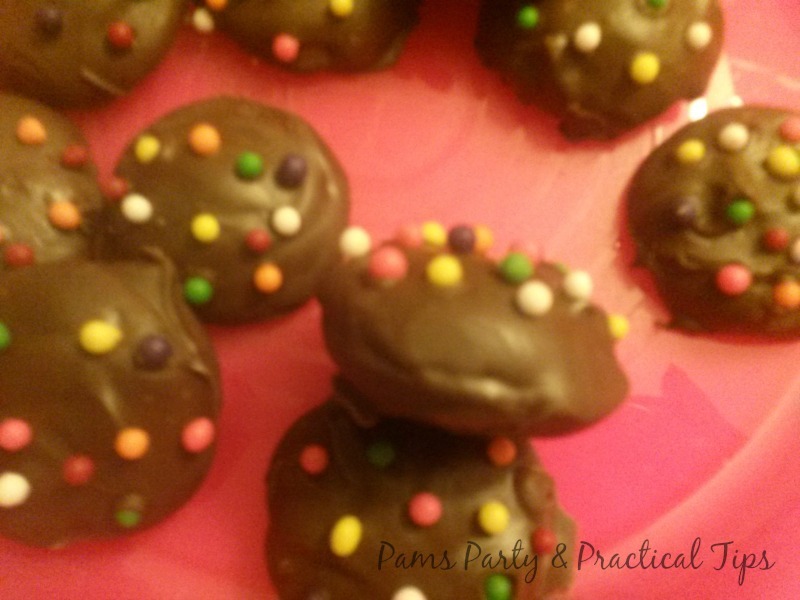 Candy bombs have a darker look to them so I chose a dark chocolate. I had recently bought Wilton Dark Cocoa Mint and thought it would be the perfect choice. 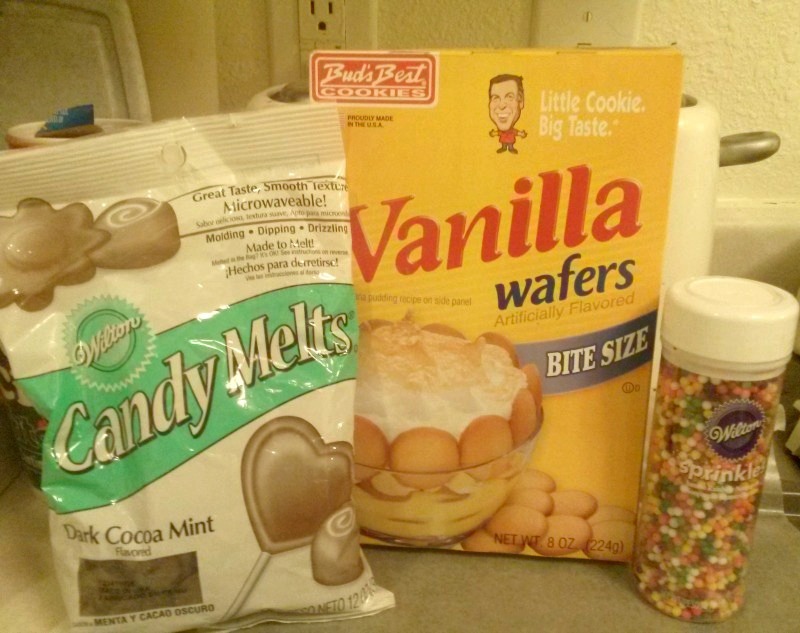 I also used Wilton Sprinkles that I bought at the craft store with a coupon. I melted some of the Wilton chocolate in a glass bowl in the microwave using the 30 second method. Basically that is you heat the chocolate in 30 second increments stirring each time. It only took a little under a minute. 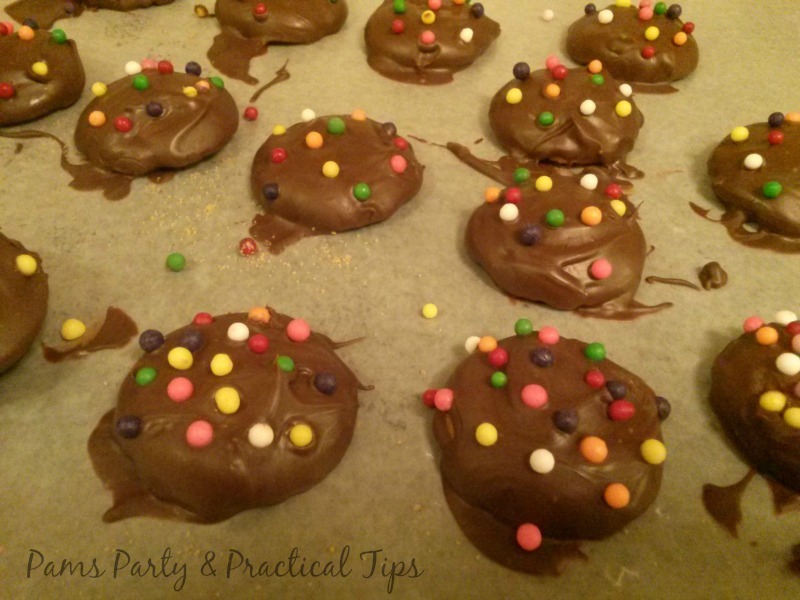 I dipped the wafers in the chocolate and then dropped the sprinkles on. 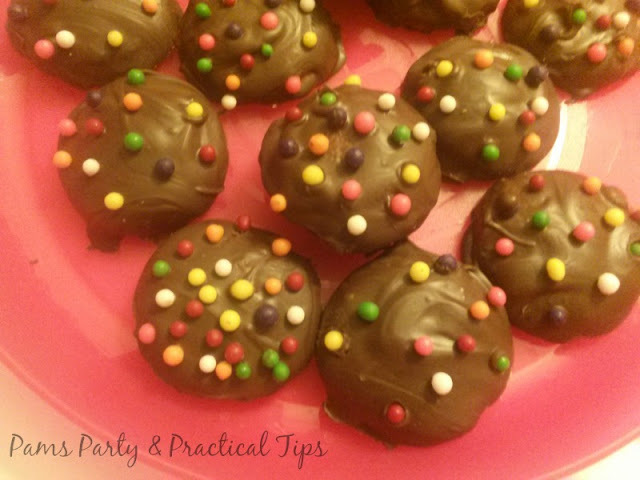 If you would really like to, you could use a small tool and line up the sprinkles in a more precise manner, but I just do not have the patience. In the game. the bombs are covered with quite a few sprinkles in a random manner. I thought the cookies looked a little better with a little less sprinkles. As an experiment I put two of the wafers back to back before dipping them together in the chocolate. They are not quite the round bombs, but they do have a more 3D look if that is what you prefer for the candy bombs. 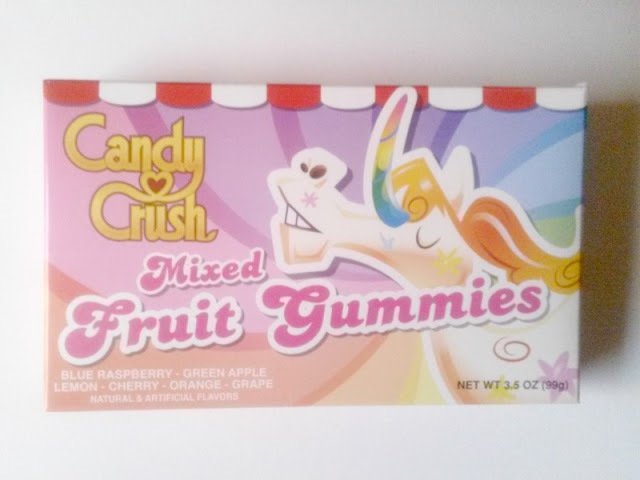 I found these Candy Crush Mixed Fruit Gummies at the dollar store recently. They would make great favors for your Candy Crush party. I also found these wrapped candies in a bag of hard candies. 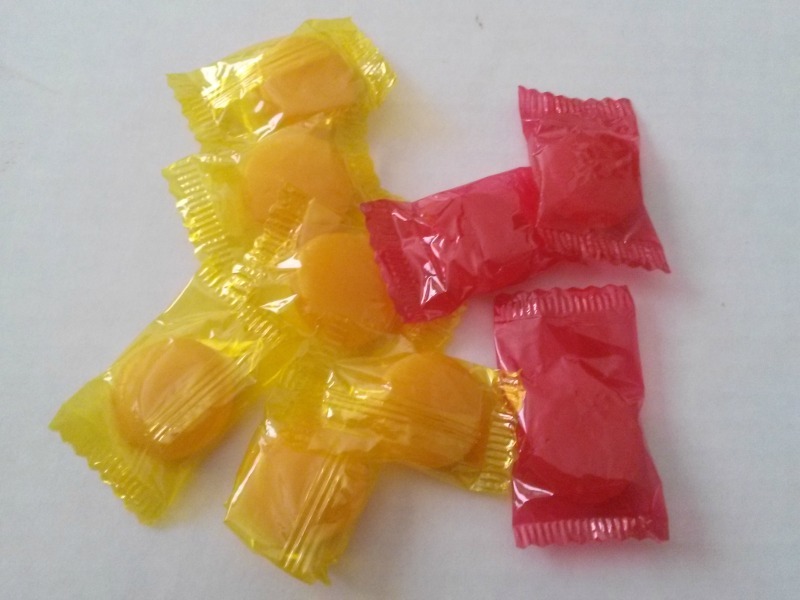 While I could only find yellow and red, they look just like the wrapped candy in the game.